There’s nothing like the fragrance of fresh greens to raise the holiday spirits of absolutely everyone. Deck your doors with the lushest greenery, grown in the Pacific Northwest. Our wreaths feature festive seeded eucalyptus, variegated holly and three clusters of pinecones and three sets of red berries on a lavish, fluffy base of noble fir and cedar. Though handsome just as they are, you may add ribbons and bows, ornaments or lights, as you prefer. We suggest adding our embossed wreath hanger for easy hanging. To remove, simply snip wires from the back of the box and lift the item gently. Our fresh designs are originally produced with extra elements so slight shedding is normal. 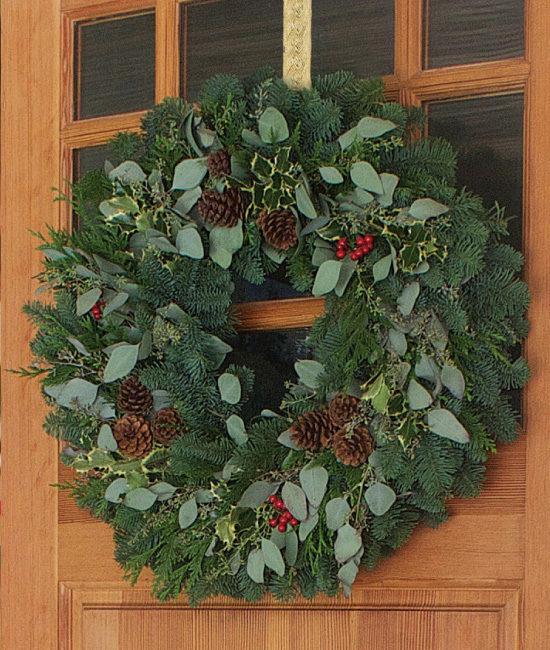 To keep your wreath fresh for the longest possible time, you may mist it occasionally with water. The designs are best maintained when displayed indoors, away from direct sunlight, strong heat sources and extreme moisture. The color will soften as the wreath dries.